Alice is not as big as Celine was around that age (Alice is only 92cm at the age of 3) and doesn’t fit on Celine’s used bike. As she couldn’t reach the ground she would immediately tip over when she tried to ride it. When I discovered the Wishbone Bike 3-in-1 bike/trike I knew this was going to be perfect for Alice and I can’t help but wish we would have discovered it earlier. You can not only raise the seat, but also flip the frame for even higher positioning and convert it from a trike to a bike. There are two different versions available. The classic wooden version and a recycled edition, made from preloved carpets. 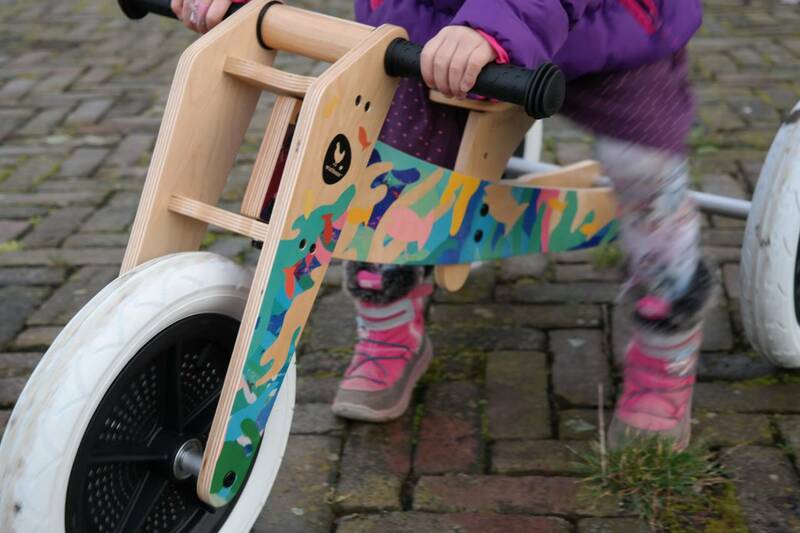 Both can switch from a trike to a bike (3 to 2 wheels) and the recycled edition has a different frame style, which has an easy system to adjust the height quickly. It can suit kids from 12 months of age. At my parents’ house Alice just started riding a tricycle at an age of 2,5… With a trike like this she could have been riding around the neighbourhood much earlier. I would say this is also where the danger lies. Young children who can barely walk suddenly can ride around stable and pretty quick. The air-filled wheels make it easy to ride on rough terrain or get off the sidewalk. This is why I would advice to put a helmet on your child and have them wear closed shoes when they are on the road. The distance between the seat and the rod for the back wheels is big enough so the kids won’t get caught with their shoes. If they do, it’s probably time to adjust the height of the seat. Personally I prefer the looks of the wooden version, but the recycled edition is on our wish list for Emile. We have a limited edition, but if you like you can customise one of the other editions with the available stickers, a nameplate or other accessories. 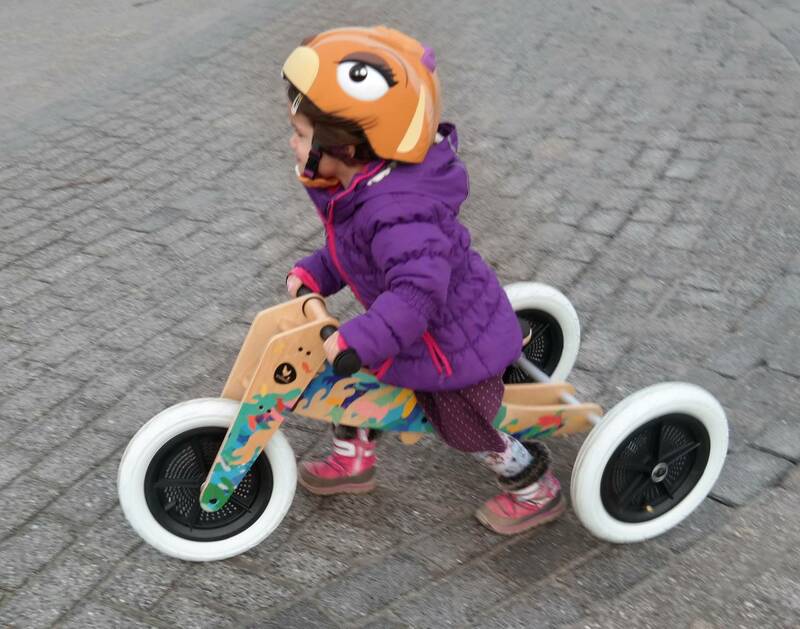 I’ve also heard the Wishbone Bike team is working on introducing a pedal kit for the recycled edition, so the balance bike will convert to a ‘real’ bike. In my opinion the Wishbone Bike makes a perfect sustainable gift. The bike arrives in recycled packaging, with an organic cotton parts bag and the bike itself is made from kiln-dried , preservative free plantation birch. Assembling is easy, I often take the backaxle off to put the bike in my car (I drive a very very very small car!) and reassemble the bike on the spot. It’s a matter of minutes to put the wheels back on. With prices around 199 euro it might seem expensive, but it’s made to last. Not only for one child age 1-5, but little brothers/sisters will enjoy it too once the first child has outgrown it. You can buy replacement parts for every single piece of the bike. I can imagine this bike being used for my grandchildren one day. I prefer to invest in sustainable products that last, and for birthdays we usually choose to buy one bigger item and share the costs with other family members (grandparents / great-grandfather) instead of having them all buy (multiple) smaller gifts. 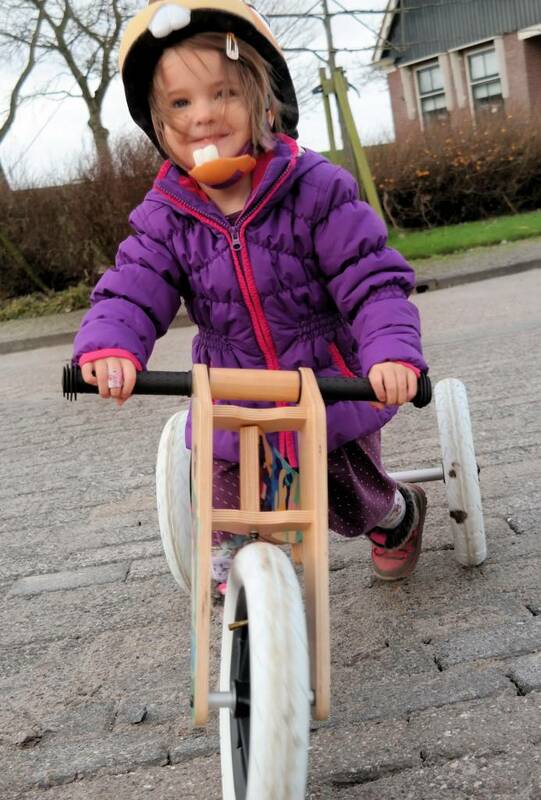 A balance bike is great to get a feel of riding a bike and practicing their balance. 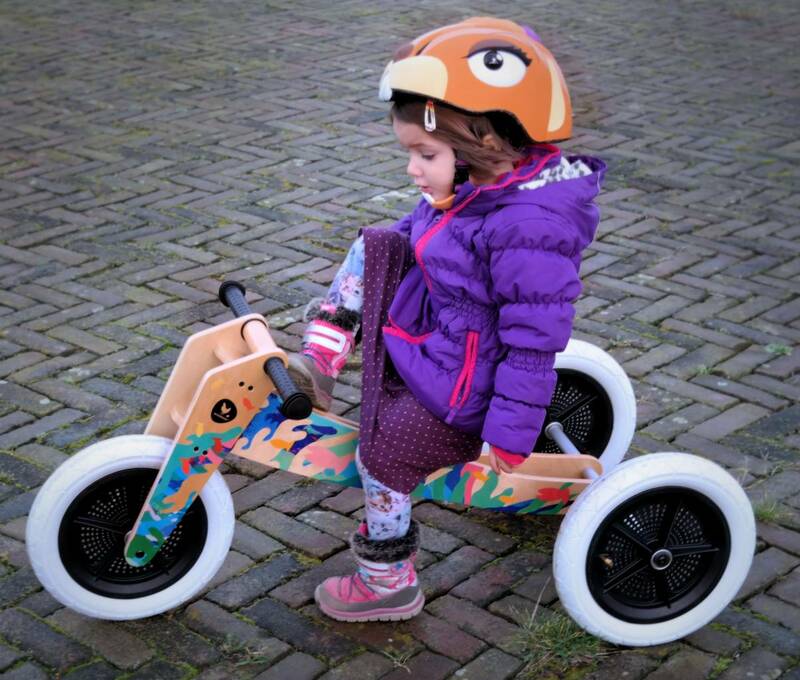 With the trike option smaller kids have a stable pre-stage before they switch to the 2 wheel balance bike. Your child will love to spend more time outside with this toy! Get yourself ready to run after your child when they learn how quick they can ride. And last but not least: just look at it! Can you imagine the looks we get when Alice is cruising down the street? You can find their shop here, and you can follow the Wishbone Design Studio on Facebook.